Taco Time | What Smells So Good? Yum! 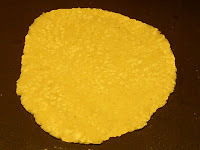 Fresh tortillas. Nothing better. BTW, I found Spice Route a crowded, annoying scene with bad service so do make this punch at home instead of going there for it.